When Kate Tempest takes to the stage to perform Brand New Ancients, audiences are offered a transformation. As she smiles a few words of welcome, the poet and performer is charmingly awkward, shy even. 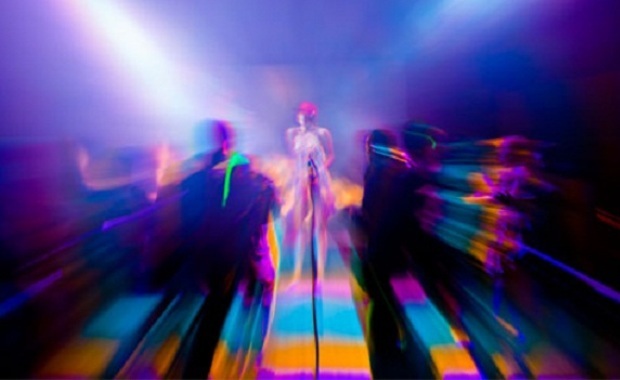 But from the moment she launches herself headfirst into her narrative, she is suddenly electric. Tempest is a shape-shifter; a small, unassuming figure in jeans and T-shirt, capable of making the air crackle. Ordinary and extraordinary all at once – just like the characters whose stories she so compassionately tells. Brand New Ancients is all about looking at people differently. Shifting the focus of mythical narratives from unreachable gods in the sky to the ordinary individuals we walk past every day, Tempest asks her audience to see “real heroes in really normal people”. Her gods are at the bar and in the betting shop, smoking a fag in the street or eating a kebab after a night out. Fighting the false idols of manufactured fame and fleeting celebrity, Tempest argues that everyone is worth our attention. These threads eventually became the interweaved stories of two families, whose tale Tempest tells through a fusion of storytelling, poetry and rap. She explains that the finished piece was unlike anything she had done before and is in some ways her most ambitious show to date, featuring the longest sustained narrative and mixing a wide range of artistic influences. In a masterstroke, Tempest’s captivating performance is also accompanied by a soaring live score composed by Nell Catchpole, allowing wordless pauses for “your brain to recover from that onslaught and let the music do the talking”. “Here’s a story that Daniel Morden told me, right,” Tempest suddenly bursts out excitedly, abandoning the point she is halfway through making. She recalls a simple but beautifully told narrative about a visit that Truth pays to a town where no one will listen to him. After a few days, Tempest continues, a stranger arrives dressed in extravagant clothes and the townspeople all gather round him to hear what he has to say. When Truth asks the stranger what his secret is, he replies that he is clothed in stories, because “the naked truth is too much for people to bear”. Falling into her distinctive rhythm, Tempest concludes: “So from that time to this, Truth has gone around dressed in the clothes of stories, and it’s easier for people to hear about themselves.” It feels like a fitting philosophy for the invention, enthusiasm and compassion of Tempest’s work. In the end, it’s all just stories. 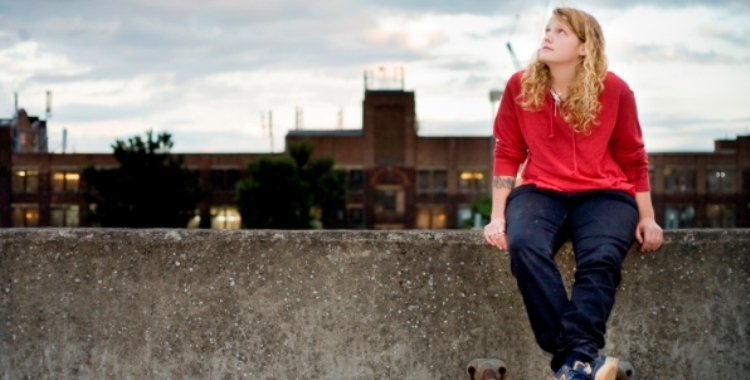 “We are still mythical,” Kate Tempest persuasively tells us, looking around with wide eyes at the crowded space of the Council Chamber at Battersea Arts Centre – historically the most un-mythical of places. Her new show, taking as its basis the ancient use of mythology as humankind’s way of explaining itself, attempts to convince us that the gods are really everywhere; on park benches smoking fags, at the bar pulling pints, in the room around us. All of us have the ability to be mythic heroes. This clash of the old and the new, of the exalted language of the gods and the lyrical banalities of the modern high street, feels perfectly at home among the gently crumbling architecture and faded charm of BAC. An unexceptional figure in jeans, T-shirt and plimsolls, Tempest commands this space, striking a startling stance between declamatory power and guileless warmth as she paces the stage with her microphone while the air around her crackles. Part electric spoken word performance and part gentle storytelling, Tempest intricately weaves together the tale of two families, ordinary and alike in their everyday miseries. For her contemporary Oedipuses and Medeas there are marriages and affairs, betrayals and violence, all equally related with a compassionate lack of condemnation. The bond of friendship between two young men demonstrates the capacity for love even when surrounded by abuse and rage, while another boy escapes the dull reality of his life by sketching comic book epics, vivid sagas of those modern day gods known as superheroes. Tempest’s characters struggle and love and hate and regret, all to the evocatively pulsing soundtrack of Nell Catchpole and Kwake Bass’ live score. Tempest’s style of delivery marries poetry, song, hip-hop, oratory and – ironically appropriate amidst all this talk of gods – something of the preacher. Fittingly both heavenly and earthy at once, she slides from close-eyed, lilting lyricism to bare, stripped down direct address, stepping out of her performative self to offer artless confidences. At odd moments, usually in the wake of a particularly crude observation, she shrugs, as if by way of charming apology for what she has created. There are undisguised slip-ups in the performance; Tempest mixes up the names of two of her characters, correcting herself with a laughed explanation, before later tripping on one of the wires snaking across the stage. The lack of polish, far from distracting, makes for something much more vital and – crucially for Tempest’s purposes – much more human. We’re all flawed, she seems to be saying without apology, and that’s OK. While in one sense taking up the mantle of tradition and, like many poets before her, adopting the role of chronicling heroes, there are no pretences of poetic perfection here. For all this easy charm, underneath the fizzing performance and beaming wit there is something urgently furious at the heart of Tempest’s plea for the value of humanity. Between the houses and parks and pubs, Tempest’s vivid brushstrokes capture a world in which “everything’s weighed on the scales of profit” and we fall on our knees before the false idols of fame, Saturday night entertainment and Simon Cowell, that modern day serpent in the grass. In this fame-seduced world, the television recurs as a symbol of loneliness, a poor but addictive substitute for the company of others. In pleading her case for the gods and heroes all around us, Tempest is arguing for an appreciation of others that does not hinge on money or fame, but a recognition of the capability for love – as much as the vulnerability to hate – that exists in all of us. We might be flawed, but we are still mythical. And these stories that Tempest is telling us, with raw and captivating power, are the new parables. Brand New Ancients runs at BAC until 22nd September. If nostalgia is a disease, then poet and rapper Kate Tempest’s explosive debut play is a startling reminder of just how sick we all are. This bitterly funny snapshot of modern life takes as its subject a lost young generation already busy reliving a past when they used to feel something, haunted by untouched dreams and paralysed by indecision. As one character puts it, “we spend life retelling life”. Ennui plagued twenty-somethings Ted, Danny and Charlotte are marking the tenth anniversary of the death of their friend Tony, to whom they each confess their fears, frustrations and limitations in a series of lyrical monologues. Everyman Ted, played with a groan of recognition by Cary Crankson, is trapped in a tedious, nausea-inducing office job and a comfortable but unexciting relationship. His best friend Danny, a swaggering yet emotionally delicate Ashley George, is his arty antithesis, the eternal dreamer lazily intent on being a rockstar and winning back Lizzy Watts’ frustrated teacher Charlotte. Each is like a fragment of an old friend, the familiar melded with the idiosyncratic. Much is familiar in Tempest’s evocative ode to modern London, a concrete playground where the routine is as grey as the pavement and streetlamps blink down instead of stars. In the richly textured, quick-fire speech, shot through with distinctive rap-inflected rhythms, the poetic is often found in the pedestrian. The profound and the mundane are never more than a hair’s width apart, as the three characters question over the course of 24 hours whether happiness lies in chasing youthful dreams or in dull yet companionable trips to Ikea. There is a refreshing honesty to Tempest’s earthy writing, which intelligently recognises the penetrating human truths that can be found in ordinary experience. The resulting vision of life’s inevitable disappointments, sharply funny as it often is, hits close and hard. 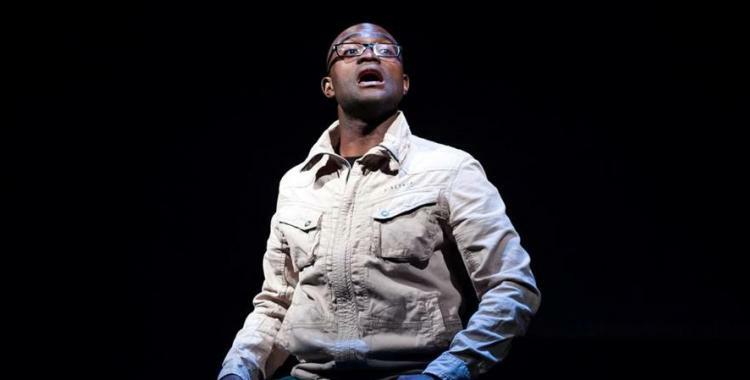 Tempest’s persuasive collision of realism and spoken word gig is given punchily paced direction by James Grieve, who with the excellent performers has tapped into a rhythm that rarely falters. Transporting us to the clubs where Londoners drink to escape, Cai Dyfan’s simple yet striking design is all speakers and boom boxes, redolent of the constant noise that plays over empty lives and that pulses powerfully through the Roundhouse courtesy of Kwake Bass’ soundtrack. In another clever touch, close-up film projections of the actors’ blank expressions accompany their fevered monologues, a reminder of the repetitive boredom that they are desperate to break out of. While this lean, muscular creation could do with some fleshing out, Tempest’s first foray into theatre is an undoubtedly impressive one. Her words paint a vivid, pulsing mural of a city writhing with its own restlessness and discontent, yet straitjacketed by a numbing sense of inertia. Her broken characters, hands wrapped protectively round microphones, warn us upfront that there will be no incredible truth, no deeper meaning in what they are about to relate. Instead the truth they reveal is all too credible.